We Have Glazing That Is Right For You! Greenhouse covers in rolls are a nominal 4', 6', and 8' wide. We can custom cut to your desired length. The material profile is extruded uv plastic allowing it to rollup easily. The extrusion runs along the length of the material. Other polyfilms come in an array of different widths. Roll greenhouse cover is a modestly-priced and strong, durable, and lightweight with many useful applications. This rugged glazing is available for do-it-yourself projects. You can create your own cold frame, mini propagation chamber, or custom designed structure. Our translucent roll greenhouse covers transmit 70-75% soft diffused light, encouraging lush plant growth. The strength of the glazing provides maximum wind and snow protection. The trapped air space in the corrugates provide optimal solar heat collection to keep your heating costs low. Double-walled high density polyethylene glazing is mildew, water, and chemical resistant and it will not yellow. A double ultraviolet treatment filters out harmful rays and extends the life of the glazing. Roll glazing has UV additives for long life and durability. 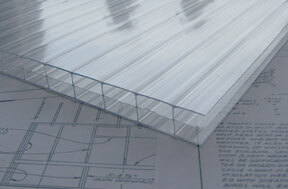 This material can be applied to your structure easily and conveniently being a 4 mm laminated continuous glazing. Just place it over your frame and attach. This polyethylene has the advantage reducing the number of seams needed to complete a large project, thereby decreasing the chance of seam leaks over time. This flexible material is much stronger and last longer than common poly-film. You can apply this material quickly and easily over your existing structure. Twin-wall corrugated plastic is a cost alternative to polycarbonate sheets for greenhouses and building construction. � Fewer seams and joints. � Follows the contour of most roof structures. � Manufactured from double-walled, high density polyethylene with UV additives for long life and durability. � Translucent corrugated plastic transmits about 72% of the available light has an R-value of approximately 2. � 4 mm (0.1574") thickness. � Greenhouse sides, ends and covers. � Sidewalls of livestock and poultry buildings. � Migration fence for poultry. � Brooder rings in turkey and poultry buildings. � 8' Wide, sold by the foot. 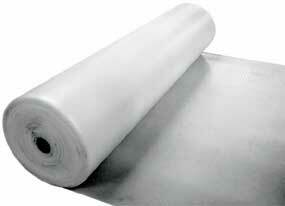 For smaller projects we recommend Solexx in the 4 ft wide roll. PLEASE NOTE: On all freight requests we need the customers name, full address and phone number.